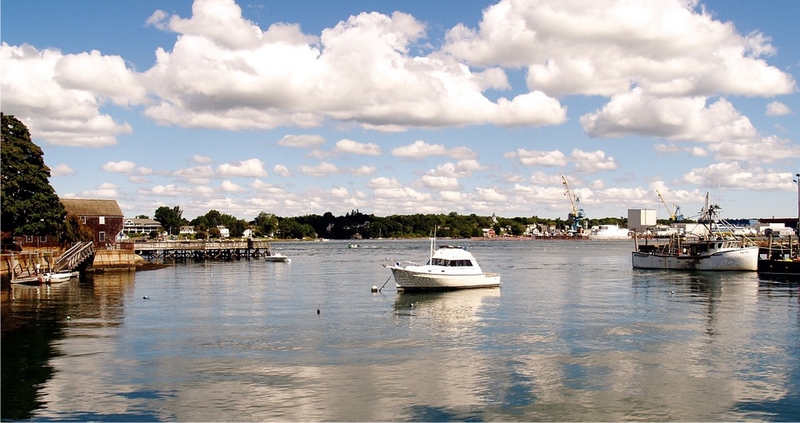 Where the Piscataqua River flows into the Atlantic Ocean, Portsmouth thrives with life. Ships arrive and sail away while tourists and locals fill the countless cafes and restaurants in the area virtually year round. 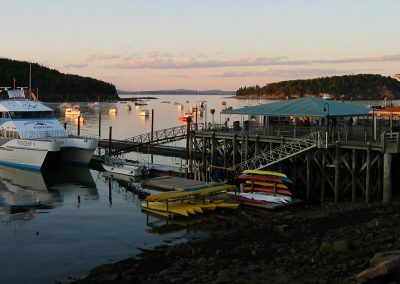 There’s a lot to do near the seacoast and we’ve described a few activities on our blog in the past, but as the old saying goes: a good day starts with a good morning and we believe that a good morning starts with a good breakfast! With that in mind, we’ve prepared a list of places that serve breakfast in Portsmouth to allow you to choose the breakfast that suits your dining desires the best. 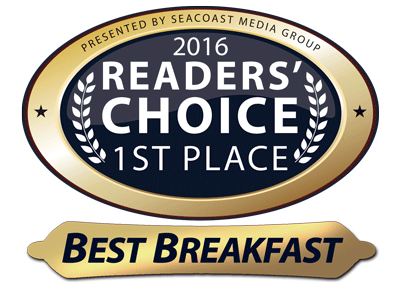 We’ve compiled a list of the top restaurants serving breakfast in the Portsmouth area in the table below. The restaurants are listed in descending order by customer rating. Simply scroll down below to view the table and read more about each entity. Colby’s is a “cozy place with a leisure breakfast”. Located fairly close to the Piscataqua River, Colby’s Breakfast & Lunch opens daily at 7am and serves breakfast until 2pm. The pancakes are popular, the prices are fair and they offer a number of decent options when it comes to breakfast dishes. Coffee is offered when there are long lines outside (this is the case quite often) and it’s worth the wait for a quick and solid breakfast in downtown Portsmouth. Among the highest rated breakfast spots in the Portsmouth area, The Country View Restaurant is the locals’ favorite. 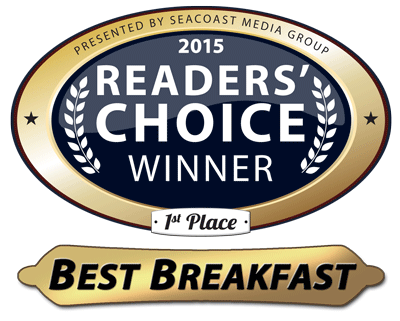 Featuring a rich choice of breakfast options, The Country View Restaurant has won the Best Breakfast on the Seacoast award many years in a row, due to fast and friendly service and delicious daily specials. The restaurant opens its doors daily at 6am (7am on Sundays) and offers breakfast and lunch all day. 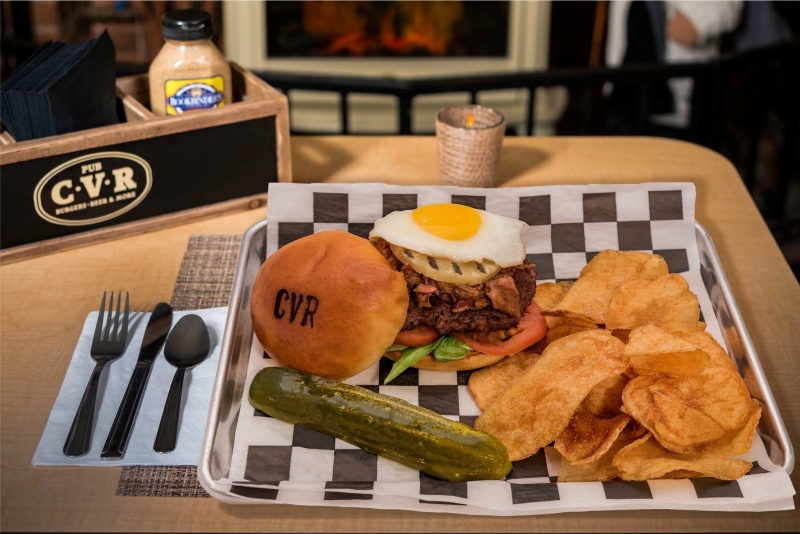 Whether you’re craving a burger at 8am or an omelette at 1pm, The Country View can create it to your liking. This popular Portsmouth area breakfast hotspot can get busy, so head over early to secure your seat (especially on the weekend). The Country View offers specially crafted complimentary coffee, locally sourced and roasted by Port City Coffee Roasters, while you are waiting for your table. The Country View Restaurant is absolutely worth the short drive out of town. The food is delicious, the atmosphere is relaxed and friendly, as are the prices, and you certainly won’t be disappointed. Located just outside the the city limits, the Golden Egg is a small place with good food and service, operating since 1983. Visitors have said they enjoy returning to a familiar place that reminds them of home. As the name suggests, be ready for a variety of egg dishes: omelettes, benedicts, and basic eggs. Make sure to reserve some time to look for a parking spot as there is simply a small parking area out front. “Inspired by street food from all over the world” – STREET Food 360° features a varied menu. The place has an urban vibe, not exactly cozy but very atmospheric. This funky spot opens at 11:30am and serves brunch till 3pm (and dinner between 4-9pm). The beer and cocktail menu is worth a shoutout. Definitely check in for an eclectic drink during the second half of the day. The upside is that it has a lot of small dishes as well as drinks and snacks. The downside is the amount of time you’ll be spending in line, as it tends to get quite crowded. The Friendly Toast comes in with a nice touch of design and a pleasant ambience. With a lower 4.0/5.0 rating on TripAdvisor, The Friendly Toast is a hit and miss when it comes to customer service, but it gets quite a few kudos for their eclectic menu and delectable drinks; be prepared for big portions! Some locals suggest that the waiting time is long during their busy hours in the morning and their breakfasts are a bit overpriced, but if you’re not in a rush and don’t mind waiting, definitely check into The Friendly Toast and try out their morning burrito. Popovers on the Square is an interesting place to try. Perched in downtown Portsmouth, this spot offers a menu with gluten free and dairy free items and features a bakery and cafe for light fare. Anyone familiar with the bakery at the Galley Hatch Restaurant in Hampton will not be surprised by Popovers’ success as ownership is the same. Reviews mention the good looks of the spot, but be ready to pay more for breakfast than in any other Portsmouth restaurant. “Expensive for an average meal” seems to be the consensus on their TripAdvisor profile. 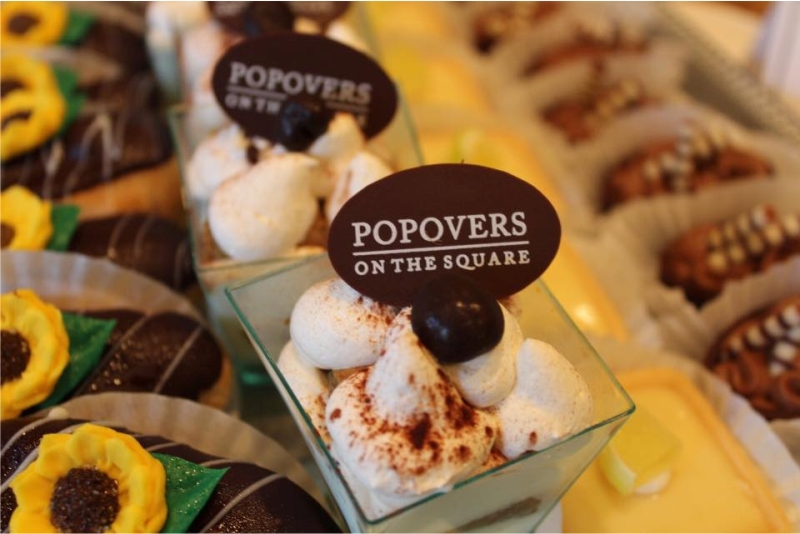 If you’ll be making it to Popovers on the Square, certainly try out their popovers, which shouldn’t disappoint! More of a diner and less of a specialized “breakfast restaurant,” the Roundabout does offer a few breakfast options. It is known for its decent portions, lots of space for big companies, and classic American dishes, as well as desserts that appear to be especially enticing, especially the pies and cakes ($6.95 per slice or $39 per cake). The restaurant is located on the Portsmouth traffic circle on I-95 and resembles a modern 1950s diner, with “a twist”. They offer a Blue Star Specials menu, which is available only after 4pm, keeping the true diner vibe alive. 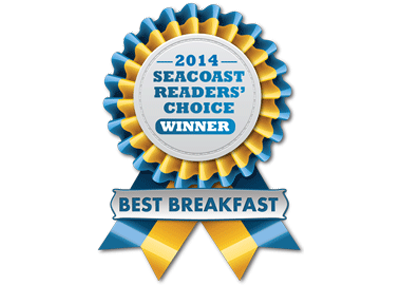 This is the list that we feel represents the best options when it comes to having breakfast in Portsmouth and the New Hampshire Seacoast area. If we missed any local favorites, please feel free to note them in the comments, or send us a message here.